This is a handsome, dramatic foliage plant originally from Mexico, where it is used to make Tequila. 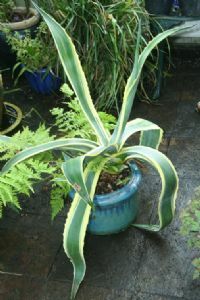 It takes many years to produce its huge flower spike, after which it dies, hence the common name of 'Century Plant'. However, it produces many 'babies' from the base of the plant which can be separated and grown on as new plants. In Europe the plant is usually grown in tubs and put outside for the summer months, where it is extremely drought tolerant. It cannot stand any winter frost, however, and should be brought indoors for the winter. The sharp spines on the end of each leaf can be snipped off with scizzors to make it less of a hazzard indoors. sold as medium/small plants in 8 to 15cm. diameter pots.